A ROARing good time for your toddlers!! Our Toddler Animal Kigdom Playland jumper is the perfect size for your smaller guests. 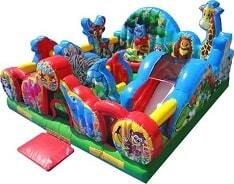 This huge toddler jumper has a climb, slide, bounce areas, ball pit, horizontal bars to climb under and through and many brightly colored animals to admire along the way. This playland has all the elements of our large obstacle courses, but in a toddler friendly size! For hygenic reasons, we do not provide ball pit balls. Capacity: 1-8 participants, up to 60lbs. Max 300lbs. Minimum space: 22'L x 20'W x 10'H.